Back in the days when Porsche Club of America (PCA) was very young, Porsches in the West were few and far between. You could drive for days through the mountains and deserts and never see another sports car, much less a Porsche. 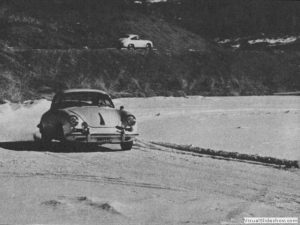 Those who owned one of the little beauties from Stuttgart didn’t know that an organization existed which was made up only of Porsche owners, but sometime during the summer of 1957, Fred Blume of Cheyenne, Wyoming heard about PCA and wrote for information. At the same time, Jim Pickens of Denver, Colorado heard about it too and PCA put the two of them into contact. Twenty-two Porsches made the jaunt, mostly from Denver, to the first organizational meeting at F.E. Warren Air Force Base in Cheyenne, Wyoming on October 13, 1957. As of November 1957, there were 14 members to carry on the activities of the uncharted Colorado-Wyoming region. 35-40 people regularly attended meetings. The Rocky Mountain Porsche Region (RMR) was officially chartered in May 1958. The territory included all of Colorado, Wyoming, Utah and the northern part of New Mexico. Over the years, RMR has held Rally’s, Autocrosses, Tours, Concours, Tech Sessions and numerous Driver’s Education Schools. The shape of the region has changed to include Northern Colorado, Southeastern Wyoming, and Southwestern tip of Nebraska, but the membership is strong and currently there are 2600+ members. Porsche Club of America has held numerous Parades in the Region.